Paint Colors is an online paint store offering free advised and tips in metallic paints, as well as stains and coatings for the professional or a do-it-yourself kind of painter. 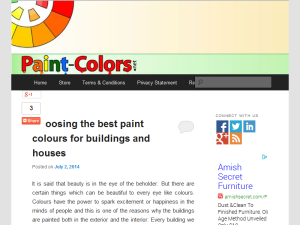 This what your Paint Colors Blog Ad will look like to visitors! Of course you will want to use keywords and ad targeting to get the most out of your ad campaign! So purchase an ad space today before there all gone! Changes in the art of wood-finishing has come about through the rapid advancement in the development of quick-drying, very lasting, nitrocellulose lacquer paints which are new finishes derived from the realm of magic and mystery. Present-day lacquer paints comprise of varnish-gums in addition to nitrocellulose, and dry so quickly that they are just about dust-proof; yet they set gradually enough so that they can be smeared with little training by use of either a brush or a spray-gun. The lacquer is basically a clear or colored varnish that dries up rapidly as a hard and long-lasting finish. It may range from being ultra-matte to high glossed. . The lacquer paint was introduced by the Chinese for making myriad decorative items and handicrafts. Wooden structures of temples, communal houses, and pagodas were red-lacquered and trimmed with gold in the early centuries. Similarly, altars, pillars, panels etc. were lacquered with brilliant sparkling colors. Lacquer, in its raw form, is a clear sap derived from the bark of six species of trees grown in the North and South Vietnam. Fresh lacquer is whitish and turns brown when exposed to air. Almost all of the large paint and varnish manufacturers are now making lacquer paints, which in some cases are being unwisely publicized as appropriate for nearly all purposes. In the hands of a skilled finisher lacquer paint produce pleasing effects, but when a novice attempts to spread them with a brush over newly varnished surfaces, there is sure to be trouble because the solvents in the lacquer are similar to those contained in some of the paint and varnish removers and the newly applied coating reacts with the old, resulting in a spoiled finish. Lacquer paint finishes have grown in popularity on wood frames, fireplace designs, and designer window toppers, wooden cabinets and, when used properly by one who understands them and their limitations, they are attractive and durable and possess many good qualities. Clear or transparent lacquers contain five types of ingredients: nitrocellulose or pyroxylin, varnish resins, solvents, plasticizers and dilutents or thinners. Pigmented lacquers (for use on everything from fireplace accessories and wood frames to wall painting boards) are often called lacquer enamels. These enamels contain one extra ingredient. They must give obscuration or hiding power and to give this opacity various kinds of pigments and coloring matter are added to the lacquer. Pigments and coloring-matter may therefore be considered as the sixth type of ingredient found in lacquer paints. The lacquers of the present day usually contain a nitrocellulose of rather low viscosity and certain resins which, when combined, produce a film that is much like a varnish in body or solid matter. The distinctive ingredient in a modern lacquer, that makes it quite different in behavior from other varnish like materials, is given various names, such as nitrocellulose, cellulose nitrate, soluble cotton, and pyroxylin. Lacquer paint is been in use for over a century now but its significance and beauty has not mellowed down over the years, instead it is well appreciated in the present day for its durability and beauty. Whether it is a case of necessity or preference, you will at some point find yourself considering a new fresh coat on the walls of your home.Painting is a great opportunity to add a personal touch to the home whether it is old, rented or owned. You can choose your favorite paint colors to create a signature and unique look that brings a good feeling to you. If you have different paint color combinations that you love, it can also be used to draw inspiration on a color palette. Selecting the color can be daunting, but if you love a color and it evokes the feeling that you want then chances are good that you will be happy with your choice for many years to come.When you have decided on what mood you want to create as well as the color family you want to use, it is better to get an accurate idea of how the room as a whole will mesh with the new color. Your furniture, the amount of natural light in the room, and the type of flooring you have, all will play a part in how the paint color will look in the room.If you want a cozy feeling, darker colors might be the way to go since they can make the room feel smaller. If you want the room to feel larger and more expansive, lighter colors on the walls will help. The kitchen for instance, is typically a place where family and friends gather, snack, and engage in friendly conversation. This is a great area to use bright, cheery colors like shades of red, orange etc. that promote feelings of well-being. Yellow has long been a popular choice for this room, lighter shades of yellow are linked in our minds with happiness and freshness. The bedroom is your place of haven from the rest of the world. If you want to give the room a sensuous feel, light red paint can envelop you in feelings of passion. Pink is the classic color for romance, but can be too girlish and overpowering for many people. Blue is a great choice for the bedroom if you want to create an area of tranquility. The color blue promotes feelings of stillness and has a calming effect on the mind. Shades of green and violet also compliment well with bedroom settings and bed linens. Blue also acts as an appetite suppressant making it suitable for dining room as well. Glossier finishes reflect light and are easy to clean, making them a good choice for trim or kitchen and bathroom walls that need to be cleaned more frequently. A matte finish is better at hiding flaws in the walls and creates a softer look by absorbing more light. Many paint manufacturers offer customers standard paint color palettes. These palettes allow you to see how various colors can give you unexpected combinations even against the furnishings in your home. These paint color palettes are a handy way to experiment. While there are seven basic colors, the combinations and permutations to choose from are endless. If you are the owner of Paint Colors, or someone who enjoys this blog why not upgrade it to a Featured Listing or Permanent Listing?